Within a period of ten days in early February, the spirits of two magical figures, La Candelaria and Guadalupe del Carmen, turn the small village of Chanco into “Celebration Center”, filling its streets with religious celebrants and aficionados of the Mexican ranchera. These two personalities seem, at first blush, not to have much in common, but on consecutive weekends they both bring comfort and joy to the fine people of this relatively poor, mostly rural, forgotten region of central Chile, and give the four thousand residents of Chanco a chance to share their picturesque burg with tens of thousands of visitors. 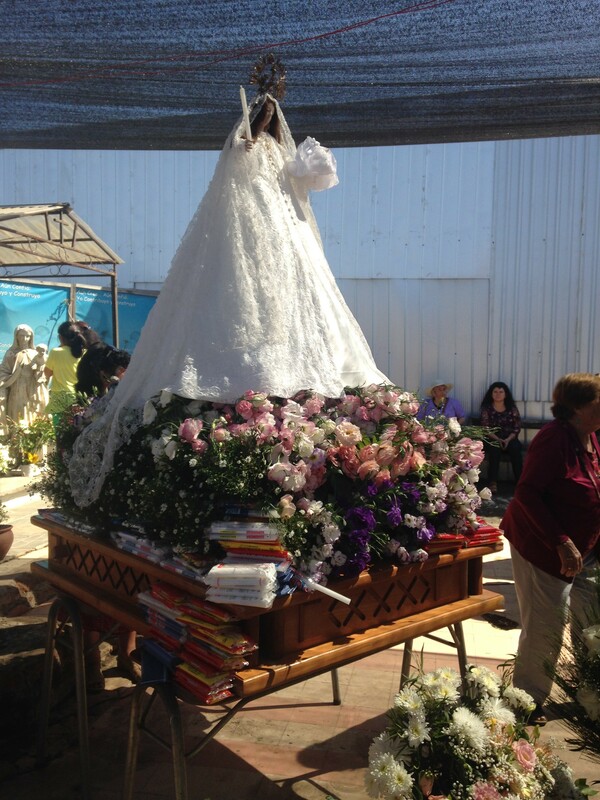 The Fiesta de Nuestra Señora de La Candelaria is held each year on February 2, regardless of the day of the week it falls; this year it was a Monday. That morning I drove into Chanco very early, since I had heard that the ceremonies began at 7 AM with several religious services culminating in the main Mass at around noon. I didn’t want to miss anything, so went in early. As I drove into the center of Chanco I was reminded of the first time I visited this small town over a decade ago. I had stumbled upon a very special part of rural Chile, frozen in neocolonial time with a unique, enchanting personality. Since then Chanco has had a magnetic influence over me, drawing me there for numerous visits whenever I have the time, and even sometimes when I don’t. On one of those days, February 26, 2010, to be precise, I again passed slowly through Chanco, on my way to visit a friend in Arauco, further south. As is often the case, I had spent a couple of lovely days with Veronica and Joaquin at their modest place strategically placed on a bluff above the small fishing village of Loanco in plain view of the solitary lighthouse, Faro Carranza, at the mouth of the Loanco River. I stopped to take a long look at the attractive main street lined with colorful one-story adobe homes with their classical wood framed windows and doors providing a continuous wall of beautifully simple colonial architecture. I bought a newspaper at the only place in town that sold them, and I went by the small cheese factory on the edge of town to buy some fresh Chanco cheese. Then I drove south, leaving the Maule region behind, to Concepción, the capital of the Bío Bío Region. 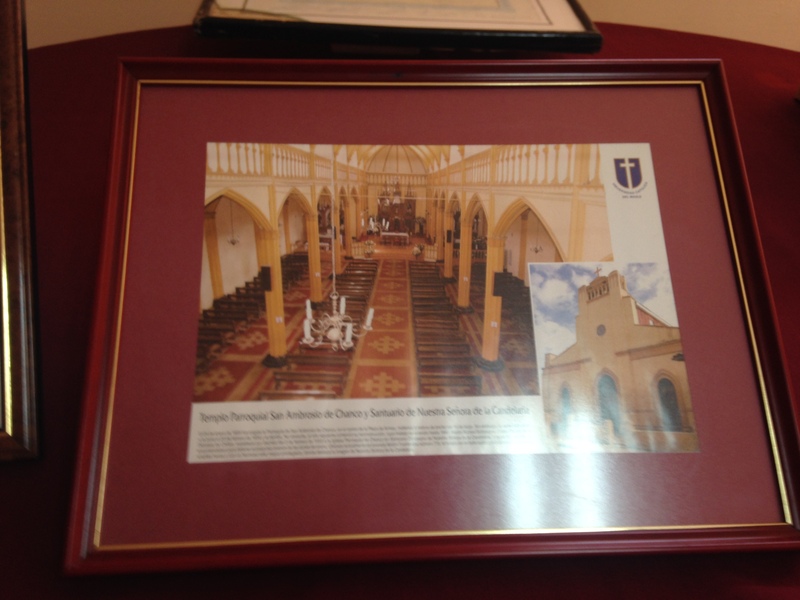 Photo of San Ambrosio Church, pre-2010 earthquake; Chanco, Chile. 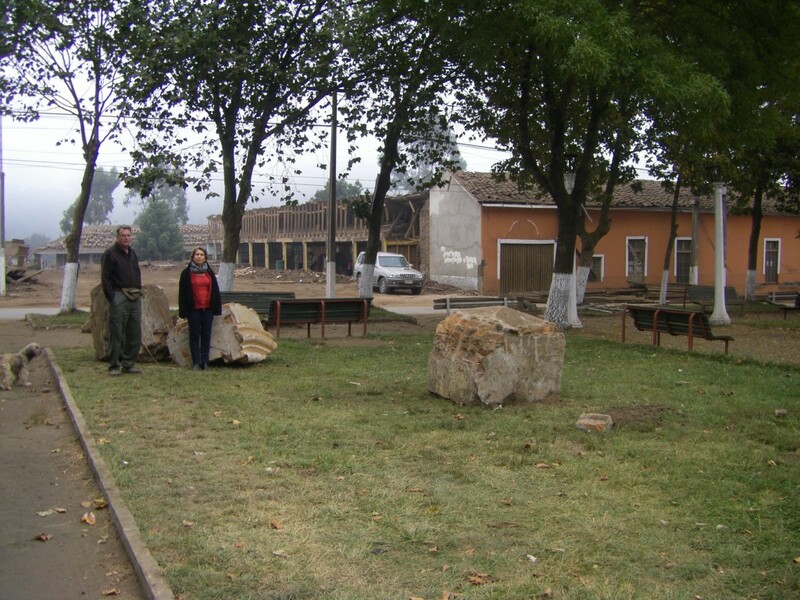 On that fateful day in 2010, Chanco’s beautiful neogothic San Ambrosio church, with its three large chambers built with timbers of heartwood roble, one of Chile’s most valuable native hardwoods, fell to the ground. 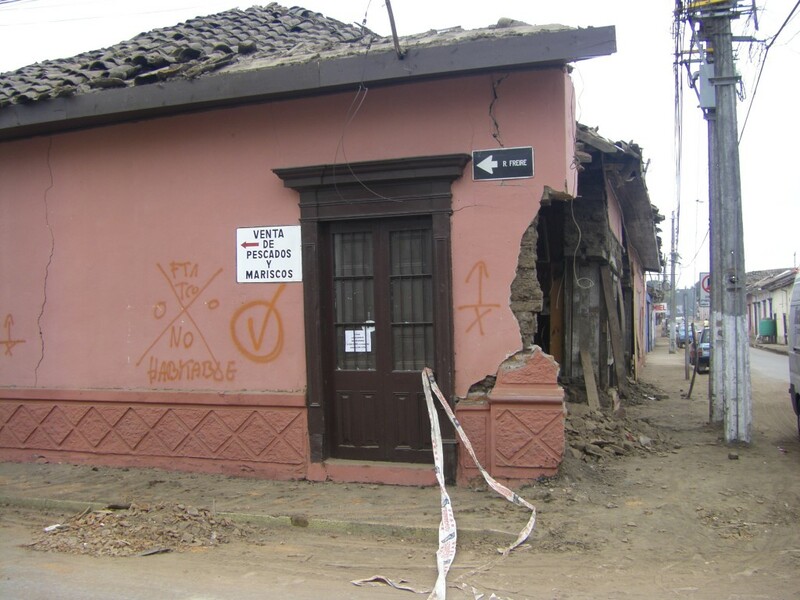 A terrible loss to the village, and today, after five years, their beloved church and home to their Patron, the Virgin La Candelaria, has still not been rebuilt. So on this lovely summer day in 2015 I drove into town, parked at the Dr. Benjamin Pedreros hospital (named after Joaquin’s father, a revered local physician), and walked along with the first groups of pilgrims towards the space where San Ambrosio had stood majestically. On this day it was only a tented space populated with hundreds of folding chairs, made holy with the normal trappings of the Catholic Church and magical by the presence of the shining white image of La Candelaria. It’s not completely clear when and how the image of La Candelaria arrived in Chanco. Although La Candelaria is celebrated in other Chilean towns, Chanco seems to take ownership of her most seriously. One source claims this celebration has been held throughout Chile since 1780, when a group of miners and muleteers discovered a stone image of the Virgin and Child somewhere in the Atacama desert, while seeking shelter from an inexplicable thunderstorm. In Chanco they believe the Candelaria image was brought to Chile by the Spanish soldiers who built a fort at Chanco. Soon after, under attack by the original inhabitants of this part of Chile, they returned north, discarding La Candelaria in a boldo tree nearby. Someone must have found her there, for she was included in an inventory of Chanco’s temple in 1737, after which she began to perform miracles. Some believe that that same image was taken to the beach outside of town to protect the town from the tsunami that followed the terrible earthquake that hit the area, especially Concepción, in 1751. The town was not destroyed at that time, so La Candelaria became Chanco’s protector. She is credited with the successful establishment of the forest that Chile’s first forester, Federico Albert, had planted between the beach and the town, to prevent the advancing sand dunes from covering the town. After paying my manda, I sat on a bench in a shady spot along one side of the “church”, and observed as hundreds of worshipers sauntered amongst the chairs, to the front where La Candelaria was positioned, beautifully veiled, dressed in a flowing lacy white gown, a gold crown on her head, holding the Child (also crowned) in one arm and a candle (to “light the way”) in the other hand. When I sat down, one family, mother and two children, were mesmerized at La Candelaria’s feet, obviously deeply affected by their closeness to The Virgen. I had to wonder, where is the father of these two children, one of which seems to be suffering some sort of malady, and what are they expecting of La Candelaria? Others brought packages of candles to leave at her feet. Everyone who approached her seemed to want to touch her dress, and many did so in deep prayer, some chanting quietly but most silent. 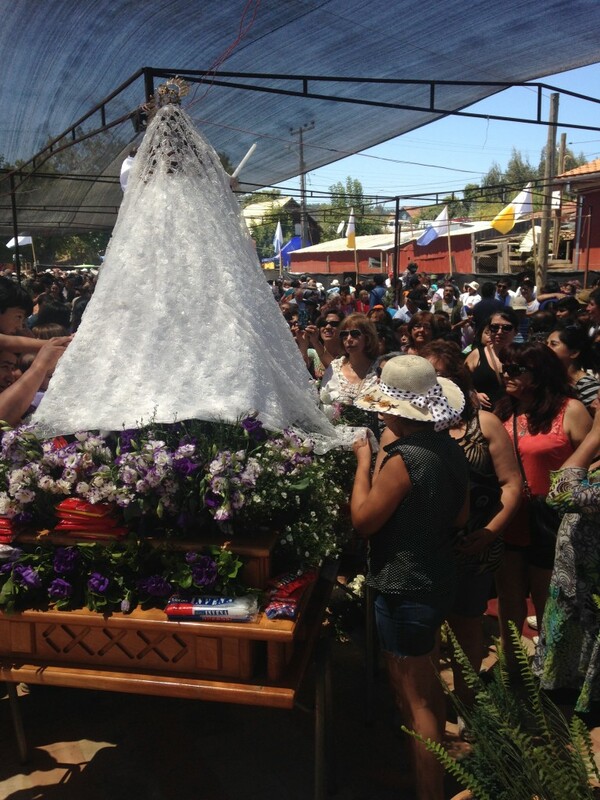 All morning, even during the formal services, pilgrims would walk to the front and pay their respects to La Candelaria. As the morning advanced, the chairs became filled, and by near noon, with a full house, the front rows reserved for the local authorities began to fill, and the Obispo from the Linares Diocesis, accompanied by parish priests from the neighboring towns of Empedrado and Parral and a whole retinue of aspiring young priests, ceremoniously paraded to the front, and the main mass was held. At a point near the end of the mass, representatives of the neighboring towns that make up the Parish formed a long line down the center aisle and brought gifts to the alter: boxes of strawberries grown in the surrounding fertile fields, wine from vineyards in the hills, weavings made at home with sheep’s wool sheared and woven on the farm, jars of jams and jellies made with local blackberries, blueberries, red raspberries, and murtillo, tortilla-like breads roasted in the coals of wood fires, and other local products. The mass ended with an announcement that at 4:30, the procession featuring La Candelaria would begin at the church and proceed down the main street in town, through the area where hundreds of vendors had set up in the early morning hours. The Candelaria festival is, basically, a religious event, but it also serves as a rare opportunity for many people who seldom come out of the countryside or from small neighboring villages to come into Chanco to shop for everything from clothing to pots and pans, tools, boots and shoes. Almost every street in town was lined with vendors marketing their goods, so many that you could hardly walk down the streets. We made our way to the center square, which unfortunately was closed off and under renovation, and found a place where the six of us could get a table for lunch. Chanco is not repleat with accommodating restaurants; in fact, there really are only a couple of places where small family-run kitchens prepare traditional Chilean campo food, like cazuela, pastel de choclo, porotos granados, roast chicken, and tasty overcooked beef brisket called plateada. These dishes are Chilean “comfort” food, especially when served in the festive environment of Chanco on La Candelaria day, so we ate well and then enjoyed the street crowds of shoppers until it was time for the procession. We had positioned ourselves strategically on a ramp that overlooked the path the procession would take. Informally announced by a crescendo of “here she comes” from the crowd, La Candelaria moved slowly down the street, rising majestically in her pure whiteness above the sea of worshipers, all chanting, singing, praying, and cheering as they shuffled along, accompanying their Patrona in this most special celebration. In Chanco, the celebration does not include the “Chinese Dancers” seen in La Candelaria and other celebrations in northern Chile, such as in Copiapó, where the quechua influence of the northern Andean cultures is stronger. The procession passed us and moved towards the main plaza, where, when the Virgen arrived, the firemen greeted her with a three alarm blast of their sirens. 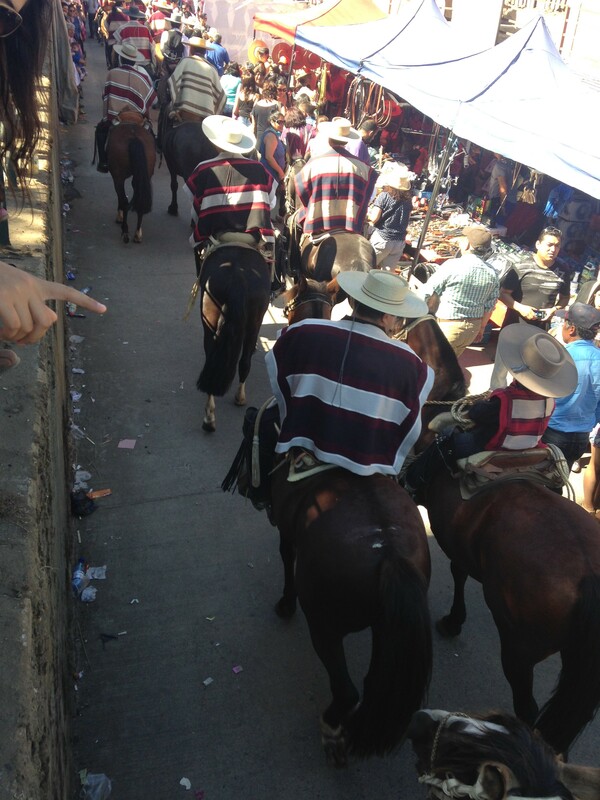 At the tail end of the procession, at least a hundred members of the Club de Huasos, Chilean horsemen, dressed in their best rodeo style capes, their mantas, pranced by in pairs presenting a most colorful finale to the procession. 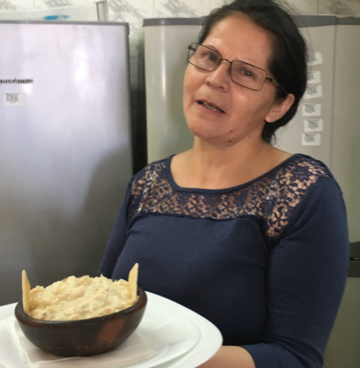 Eventually, La Candelaria would wend her way through the narrow streets back to the safe confines of the rectory, to proceed the next day to a neighboring town, Mariscadero, to celebrate with artisan fishermen who live there. We retired for the night to our place overlooking Faro Carranza, while the hundreds of merchants packed up their stalls and unsold goods, until next year. That night, as we sat on the porch watching the sun set over the Pacific Ocean, I thought about the gifts, the ofrenda, the community representatives had left during the ceremony that morning. It occurred to me that no one left any cheese, but there was a large tray with boxes of strawberries. Chanco cheese is a favorite soft, cow’s milk cheese originally produced in Chanco. But now, although there is a lot of “Chanco” cheese in the supermarkets in Chile, most comes from places further south, where there are more and larger dairies, like Osorno and Valdivia. There are only two places around Chanco where one can purchase Chanco cheese made in Chanco. Both are very small, and sadly they are not really keeping alive the idea that Chanco is synonymous with cheese. So during this visit I stopped at both, to buy a nice big chunk of true Chanco cheese. Strawberries, on the other hand, introduced in the last decade to this part of Chile, are flourishing. Along the roads leading into Chanco from the north or the east, there are acres and acres of strawberries. 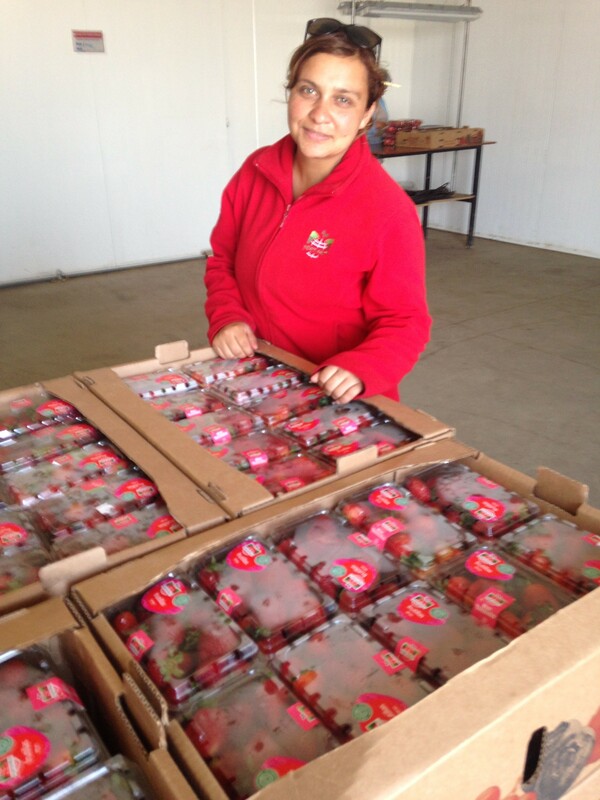 At first, there were a few small farms, then seemingly over night larger fruit companies appeared, a refrigerated packing plant sprung up, and now strawberries from Chanco, Chile, show up in markets in the US and other countries. With the right varieties, a system that uses plastic tenting at the start and the end of each season, and technically advanced quality control, the Chanco strawberry is outperforming cheese as Chanco’s emblematic agricultural product. Is this progress? I seem to think so, especially when you see so many people, especially women, working in the collection and processing of the berries. Every once in awhile there is a rumor that someone is going to reintroduce enough dairy cows to the area to produce Chanco cheese again in grand scale. It seems like it would be a good thing. The hefty red wine produced in this part of Maule from traditional carignan, país and carmenere grapes goes so very well with both strawberries and Cheese. On a warm summer afternoon, the idea of a “Chanco Happy Hour” featuring a pitcher with diced strawberries soaking in cool red wine, accompanied by a plate of sliced Chanco cheese, is enticing. 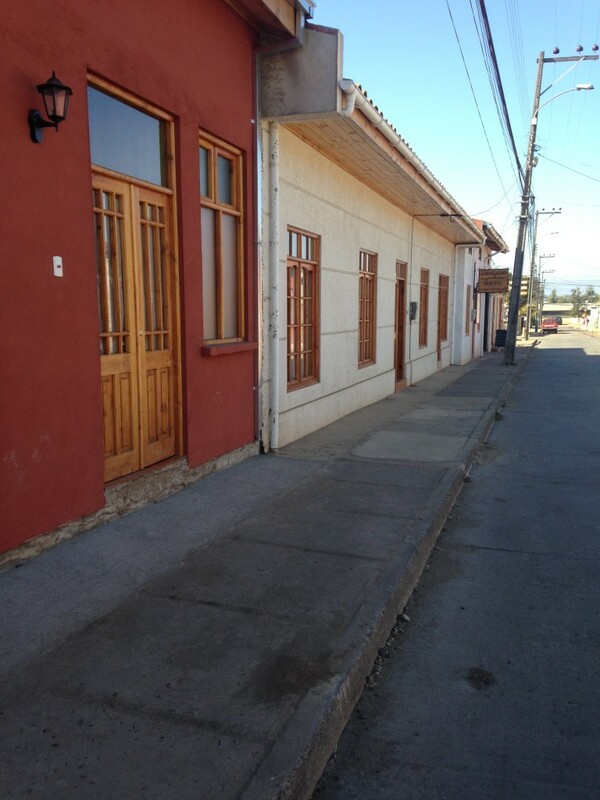 Visitors to Chanco to participate in the Candelaria celebration would have to notice that, little by little, Chanco’s main streets are recovering that colonial look it had prior to 2010. Slowly, house by house, they are rebuilding their homes without losing the historical colonial look of rural Maule. Several homes along the main street are done. They again have the classic wood-framed windows and doors, strengthened block walls faced with a coating that resembles the adobe structures that suffered so in the earthquake, and are painted in the earth colors that make this architecture so very attractive and fitting for a modest, rural village like Chanco. 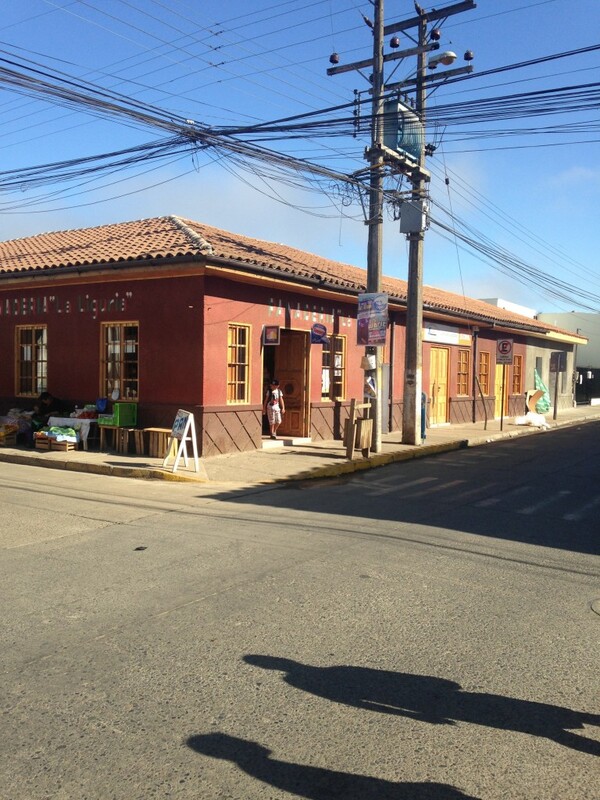 Rebuilt Liguria Bakery, Chanco, Chile 2015. The building beside the central plaza that housed the dingy, run down Mono’s Pub bar has been rebuilt into two structures with the typical corredor, or covered sidewalk, a corner store I thought would have to be totally destroyed has been strengthened and, without losing the colonial lines, is now the thriving Liguria bakery. Several homes I watched being rebuilt slowly during my prior visits are now finished. When the reconstruction of the main plaza is finished later this year, the most urgent reconstruction project in Chanco is clearly the San Ambrosio church, which shows no outward signs of being rebuilt. Strange, that such an important structure has not been rebuilt, but I was told the rebuilding project is held up in the review and approval process because the temple is declared a National Monument. This may be the reason, but whatever the reason, La Candelaria deserves an appropriate home so she can continue to protect Chanco and Chanquinos. 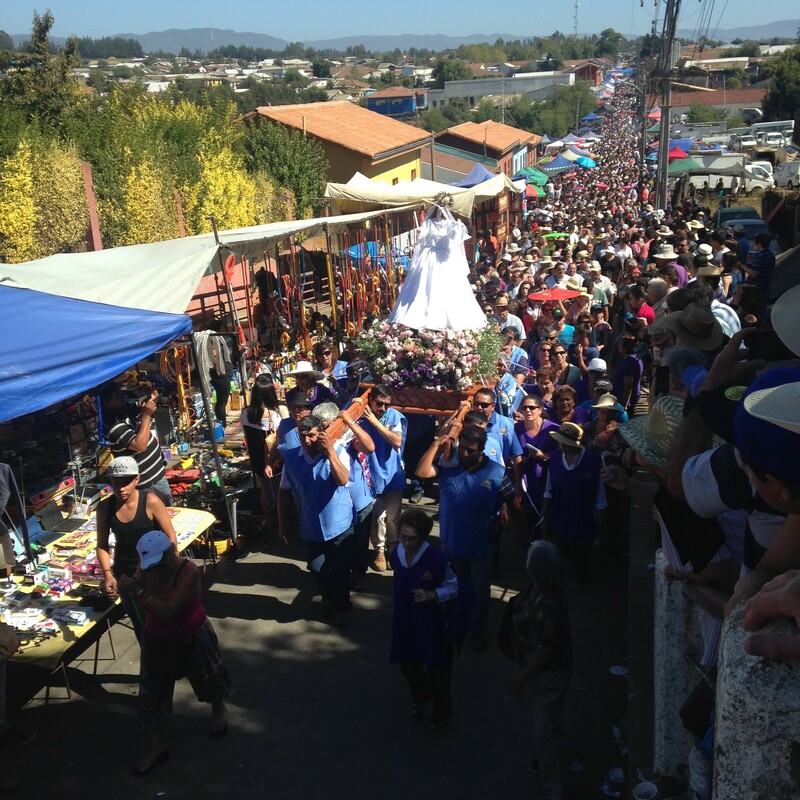 Chanco did not have long to recover from the crowds who came on February 2 to celebrate with La Candelaria. On Friday of the same week, Chanco hosted its annual Festival of the Mexican Song, Festival del Cantar Mexicano, Guadalupe del Carmen. Music festivals adorn the Chilean landscape in the summer months of January and February. The Semanas Musicales in Frutillar, the Festival del Huaso in Olmué, and special festivals in Dichato, Talca, and of course the most popular in Viña del Mar all attract huge crowds and national media attention. 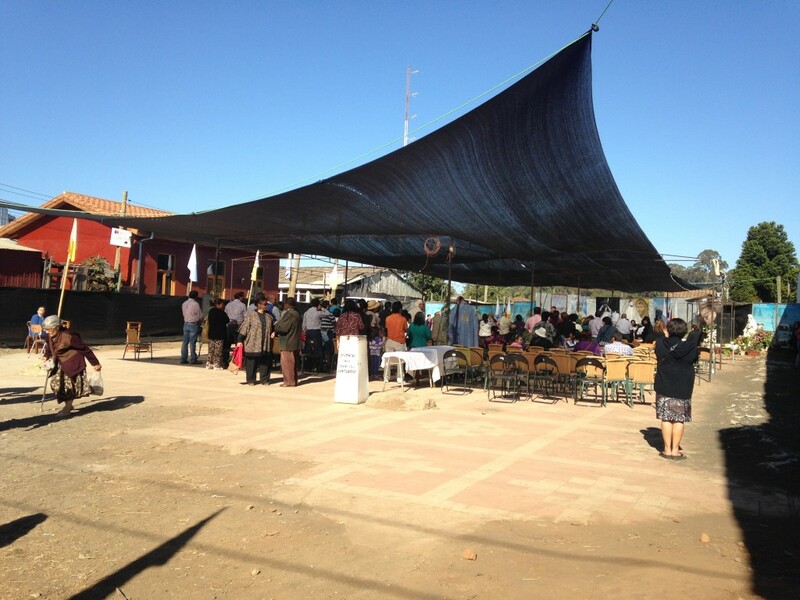 Chanco’s music festival, on the other hand, is a mostly local affair that goes unnoticed nationally, unless you have a relative or know someone who lives in this forgotten part of central Chile. Or, unless you happen to remember the most famous of Chanco’s personalities: Guadalupe del Carmen. Esmeralda González Letelier was born in the very small town of Quilhuiné, near Chanco, in 1931. Her story is as sad as the saddest Mexican ranchera, the music that she as a young girl adopted as her own to the point of becoming a national icon at the height of her career. 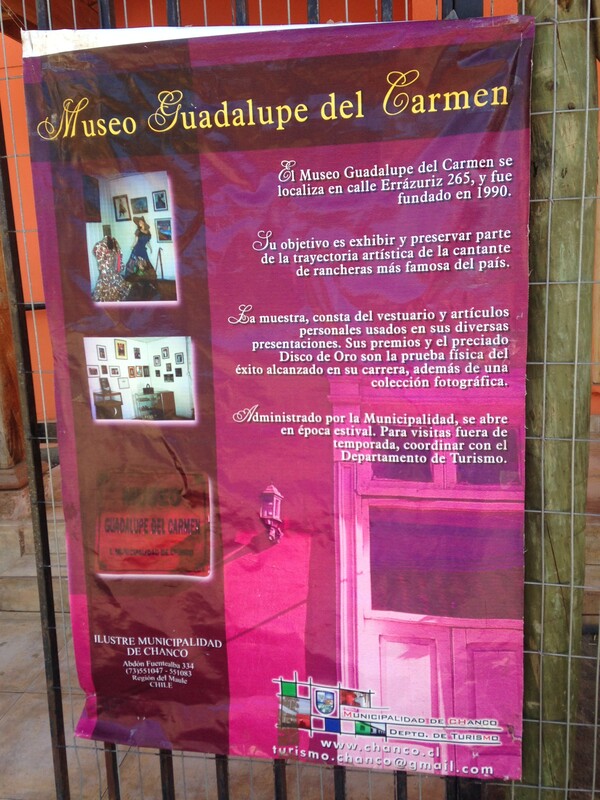 Picture of Guadalupe del Carmen from Museum in Chanco, Chile. Esmeralda took a stage name that combined the patrons of Mexico, Virgin of Guadalupe, and of Chile, Virgin of Carmen. Her music touched the soul of rural Maule, and the rancheras she sang first in public places like buses, train stations, and on the street and then in concert halls, hotels, and stadiums throughout Chile connected her to the struggling class of Chileans who saw their own daily tribulations accurately depicted in the tragic lyrics of her songs. Her life could have been the subject of a ranchera: Marriage and divorce from one of the popular Hermanos Campos, struggles with urban vices she was unprepared to resist, and the tragic accidental shooting of a young son. She eventually died as she wished she would, singing; she died abruptly as she prepared for a performance in the Timoteo Circus in 1987 at the young age of 56. Even though she never visited Mexico, she was often introduced to audiences as Sandra, La Mexicanita from Chihuahua. She won a RCA gold record for her song “Ofrenda“, a song that extols the virtues of her beloved land, and for this, even though most of Chile today is oblivious to her, her songs and her accomplishments have made all Chanco proud. Since 1988, Chanco has held the Festival del Cantar Mexicano to memorialize their Guadelupe del Carmen. First in the local gymnasium, now in the fitting media luna where rodeos are held, this three-day event features a ranchera competition between Chilean singers from all parts of Chile, plus invited musical groups to round out the show that each night ended well beyond 3 AM. I had been warned that some of the participants in this competition would be, well, not very polished, since many are young singers. However, this year at least they were all wonderful and exciting, they were well prepared, and best of all they were backed up by a very good live Mexican musical group. After two nights of performing for the public and a panel of judges, the winner, announced on the third night, was a young singer from neighboring Cauquenes, who won over male and female singers from cities like Santiago, La Serena, Curicó, Linares, and two from Chanco itself. 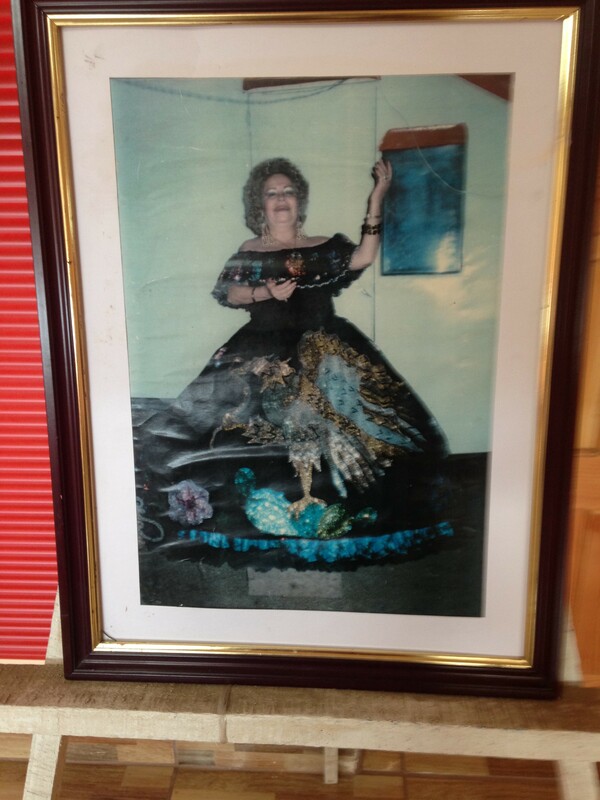 Her winning song, “Te Quedó Grande la Yegua” (loosely translated is “This old mare was too much for you!”) deserved the award, by far, although a hometown favorite who sang “La Misma Canción“, could easily have taken the prize. This year’s musical highlight had to be the first night’s performance of Chile’s most famous musical group, Los Jaivas. Their Andean fusion performance was fantastic, made even more magical by the salt of the earth setting of Chanco’s media luna, lit up by what surely is coastal Maule’s most spectacular light show. The spirit of Guadalupe del Carmen certainly lives on in Chile, with the center of gravity Chanco’s media luna, at least for three nights every February. On the day after the Festival ended, I once again drove through Chanco, checking for something new, anything different. I suspect, though, that instead I am really hoping nothing has changed, for I seem to get some comfort out of knowing a place like Chanco can still exist. What I found this time, though, was the new Guadalupe del Carmen museum. The old one collapsed in the 2010 earthquake, and only now a new one has been established just down the street from the media luna. It is a beautiful memorial to the most famous Chanquina. Around the walls are pictures of her singing and performing with other famous musicians. The dresses, shoes, and jewelry she performed in are on display, all in a setting of antique farming implements to accurately depict the time and rural setting of her roots. 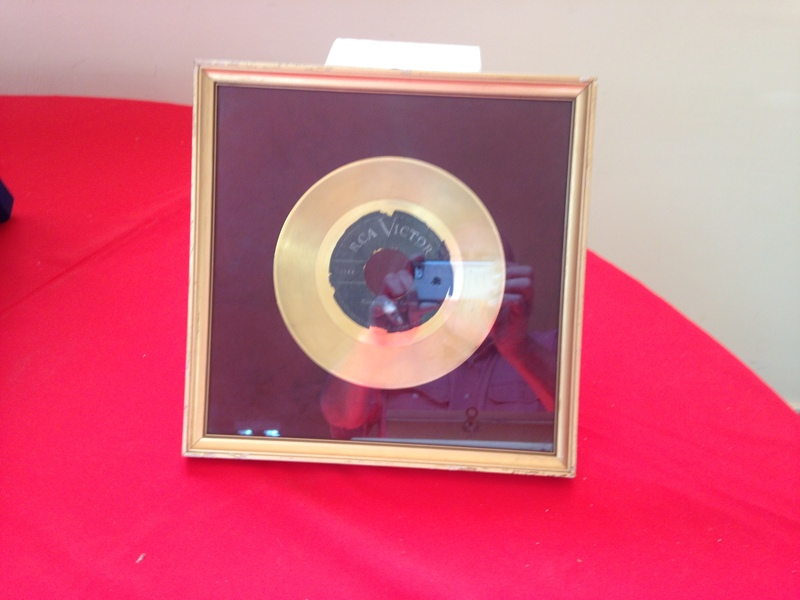 In the center is her RCA Golden record, “Ofrenda“, the main witness to her success. 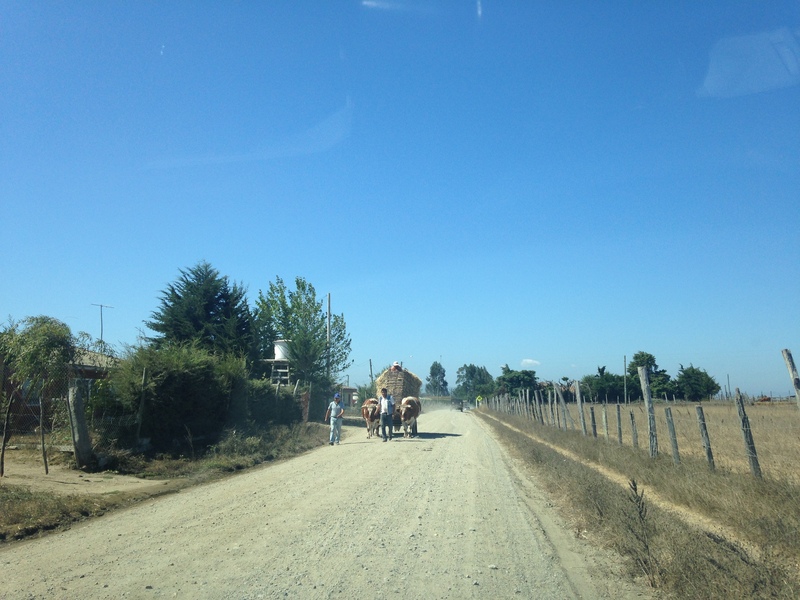 On the outskirts of town, I stopped to buy freshly picked strawberries to take back to Santiago. On my way once more, then, I made a mental list of what I would do if I were able to influence the future of Chanco and this part of coastal south Maule. 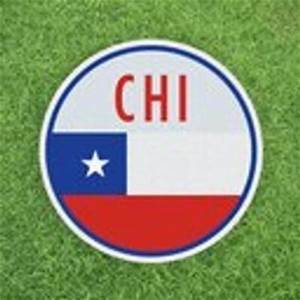 I would try to convince one or more dairy farmers and cheese makers to repopulate this area with milk cows to feed one or more artisan cheese producers, so that again all Chile can enjoy Chanco cheese made in Chanco. I would ensure that the nascent strawberry industry expand intelligently and with the appropriate plant health and water management required to produce the luscious huge red strawberries the area is now beginning to be known for. I would get authorities of importance and influence all in one room, and not let them out until they had a plan, commitments for the necessary resources, and a calendar to guide the immediate reconstruction of Chanco’s temple. And, I would promote Guadalupe del Carmen’s voice and personal story through a proliferation of CDs, videos, and writings detailing her story. Chanco is cheese, now it is also strawberries. 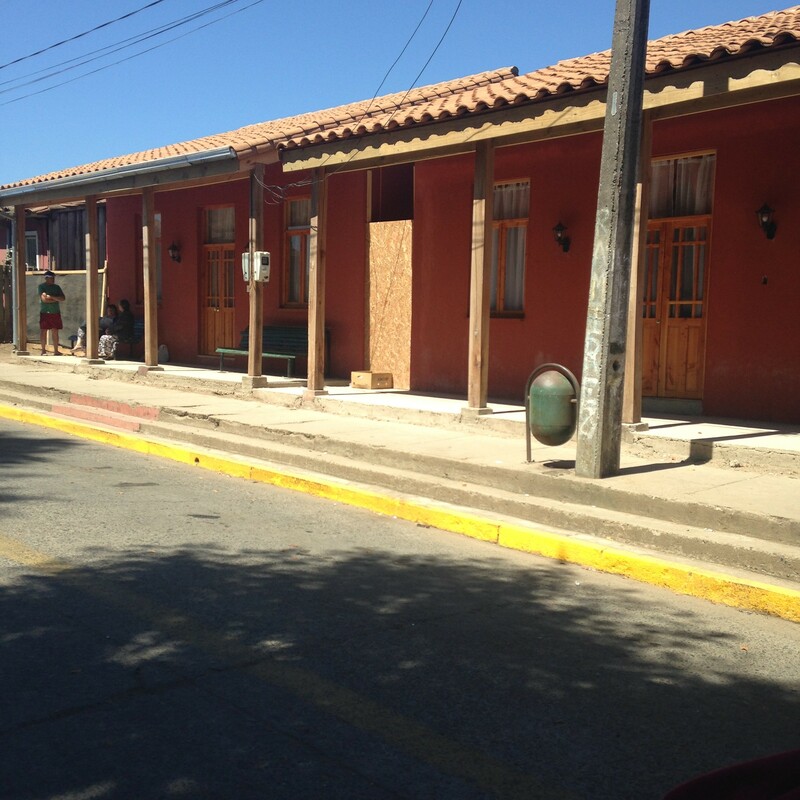 Chanco is La Candelaria, and it is the modest beauty of neocolonial rural Maule. But above all, Chanco is Guadalupe del Carmen, her attempt to escape from rural poverty, her determination to succeed, her successes and her failures, but Chanco is mostly her “Ofrenda”, depicting the rich and bountiful offering produced in their fertile fields by the wonderful people of Chanco, humbly set at the feet of La Candelaria each February 2nd. Posted on February 20, 2015. Santiago, Chile. 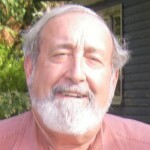 You are a great writer and tell a terrific story. I’m always waiting for the next installment. I’d never heard of Guadalupe del Carmen and it is very interesting. I’d have liked to hear the music festival. Guadalupe’s music, and La Candelaria’s festivities, await you every year in early February. Will we see you in Chanco next year? Thank you for the Cancho trip. The altar gifts–the homemade weavings, the blackberry and raspberry jams, bread cooked in the coals–and your last picture with the oxen coming down the road take me back to those days in the hills outside of Valdivia. It’s great to know that places like Cancho remain. Oh for sure places like CHANCO exist, but they are slowly changing, in some ways for the better; potable water, electrification for refrigeration, paved roads, new schools but the same old teachers unfortunately, more jobs but not necessarily appropriately paid, and last but not least, internet connection through WiFi in public places. I suppose the latter has a downside as well, but an informed public tends to be a more productive one. Chile is changing, but places in southern Maule like Chanco and Loanco, are in many ways hanging on to some of the better characteristics of the past. Lots of peace and quiet, time to reflect and savor a glass of musty red wine among them. It’s a bitterly cold day in Wausau, and I decided to stay in my “casucha” and do a little much needed “home administration” which amoung other things, includes my monthly e-mail review. Anyway, you will be pleased to know that I read and enjoyed your latest blog on Chanco. Very well-written, and it brought many good memories of our past trips down there. I even learned a new word- to wend. Paradoxically, it’s not a part of my vocabulary, but I do alot of it ( in bars and forests). Your comments about Chanco cheese provoked more than a little nostalgia and caused me to open a bottle of tinto a little earlier than is normally my custom. I paired it with a tasty chunk of Colby cheese. 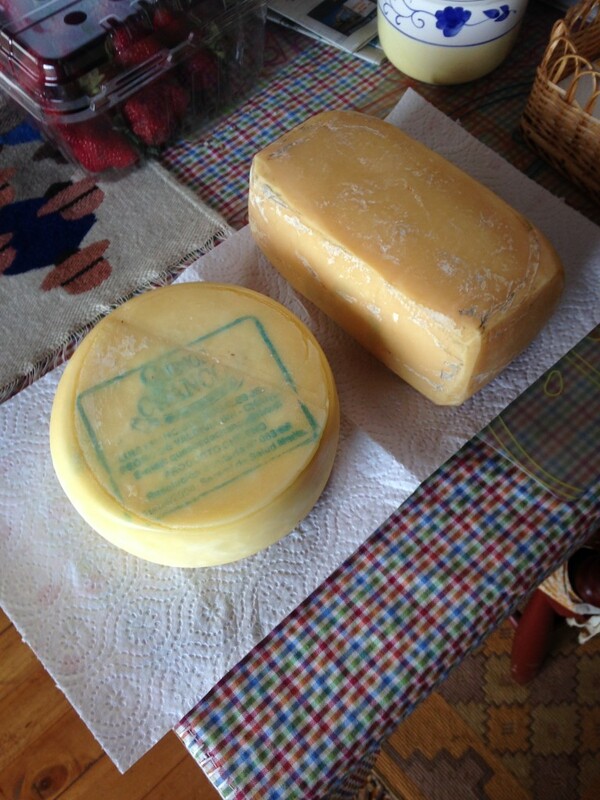 Like Chanco cheese it originated in a small community(Colby) near Wausau and is now known all over the country. All the best, and keep on writing.